Flat-bottomed barges have been hauling goods up the canals of Belgium for almost two centuries. But by the 1950s, barges had outgrown the series of locks and lifts along the Canal du Centre. This is the Belgians' €160 million answer. In 1954, the European Conference of Ministers of Transport decided that, in order to create a single standard for barge traffic on European waterways, each boat would weigh 1350 tons. And, by 1957, the "law of 1350 tonnes" was passed, dictating the size and weight of the Belgian canal network. This decision officially screwed Belgium's Canal du Centre in the municipality of Le Rœulx, Hainaut, as its antiquated lock and lift system could only raise a maximum of 300 tons. By 1963, Belgium had begun updating the canals and deemed the Canal du Centre eligible for upgrades. Another 19 years passed before crews broke ground on a replacement for the outdated lifts, the Strépy-Thieu boat lift. This massive lift ended up taking two more decades to finish and cost €160 million in total. 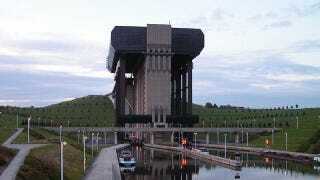 The Strépy-Thieu lift lock is the tallest boat lift on the planet, raising barges over 73 meters (240 feet) between the upstream and downstream sides. Constructed of concrete with 2200 tons of steel reinforcement, the Strépy-Thieu weighs a staggering 220,000 tons—but to be fair, it needs to be to tolerate the massive torsional strain created during lifting. It consists of two caissons, each independently counter-weighted and raised and lowered by a series of 144 85mm-thick steel cables. The caissons make the vertical journey in about seven minutes—not bad considering that in addition to the 1350 ton barge, the surrounding water and caisson itself increase the average lift weight to 7200-8400 tons. A series of four electric motors power to eight winches per caisson. However, the huge initial cost and wait turned out to be a solid investment. Once operational, the new boat lift allowed 1350-ton river traffic to pass between the Meuse and Scheldt rivers, increasing traffic by an order of magnitude, from 256 kilotons in 2001 to 2,295 kilotons in 2006.